Invite the Scripture Lady to present her preschool Bible song program “It’s Time to Give Thanks!” – a fun Scripture-filled musical presentation for young hearts. God wants us to have thankful hearts. It is never too soon to begin training our preschoolers to say, “Thank you!” and to be thankful for all He has given them. Let the Scripture Lady come and share this profound truth with your preschoolers. “It’s Time to Give Thanks” is full of lively Bible verse songs, Bible skits and games all designed to teach your little ones to be thankful. Bible Verse Song #1: “Enter His Gates” (Psalm 100:4) – Psalm 100:4 says this: “Enter His gates with thanksgiving and His courts with praise.” This is a great song to begin a program about thanking God. The preschoolers especially love its fun “scooping” moves! Teaching Point #1: We can be thankful morning, noon and night. 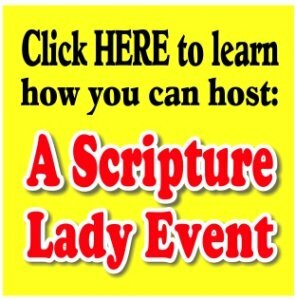 – The Scripture Lady loves to play “Charades” with children to see if they can guess what she is acting out. For this teaching point, Kathy pantomimes different activities that we all do in the morning, noon and night. It’s up to the children to guess what she is doing and then give thanks to God for each of those abilities. Bible Verse Song #2: “He is Good” (Psalm 118:1) – Psalm 118:1 says this: “Give thanks to the Lord for He is good. His love endures forever.” There is so much to be thankful for and this Bible verse song is a great reminder that God’s goodness will last for eternity. Teaching Point #2: We can say, “Thank you,” to those who are kind to us. – Preschoolers should be learning to say, “Thank you,” at their young age. Manners do matter and I believe God is especially pleased when we tell Him, “Thank You!” for all He does. A Scripture Lady Story: “Tom Turkey and Tim Turkey” – Kathy loves writing stories for preschoolers. “Tom Turkey and Tim Turkey” is a story about two turkeys who love to secretly give gifts to Mama Turkey. Mama Turkey is very grateful to have such kind sons. Teaching Point #3: We can thank God for everything. – It’s true that we try to spare our little ones from the difficult things in life, but even getting a “boo-boo” can be turned into a lesson on learning to be thankful even when things are hard. Bible Verse Song #2: “As Long as I Live” (Psalm 63:4) – Psalm 63:4 says this: “I will praise you as long as I live and in your name I will lift up my hands.” Your little ones will some day grow up to be grandmas and grandpas. As their Christian teachers, it is your desire that they will praise God all the days of their lives. This little song will remind them of this truth. Bible Skit: “What are you thankful for?”- As the program winds down, Kathy asks several children in the audience what they are thankful for. The answers are always a joy to hear!